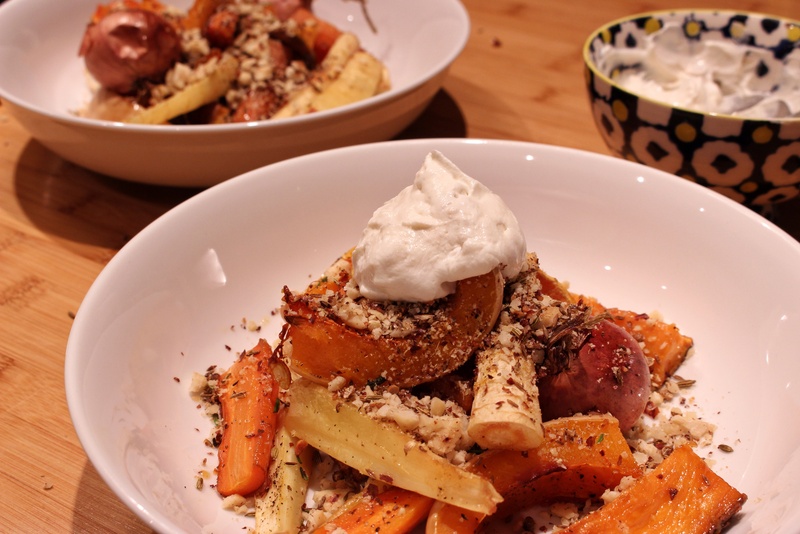 Autumn roasted vegetables, hazelnut dukkah, tahini yogurt | dash.drizzle.dollop.devour. Sunday night dinners are always some of my favourites. It’s the one night I try very hard to be at home, to have a relaxed night in, as a last bit of indulgence before the weekend is over. Sunday night is a recuperative night, to restore and soothe you for the week ahead. Good food is integral to this and I absolutely believe that a slow cooked supper is the best foundation for a languorous night on the sofa. If you can dedicate your mind to it, chopping and stirring can be almost meditative, having a gentle rhythm to help escape from that endless to-do list whirring around your mind. Not to mention that slow cooking naturally lends itself to comfort foods – succulent slow cooked meats, casseroles and puddings, such a luxury compared to weekday grab and go meals. The rain felt endless this weekend. A deluge from the sky. The sort of weather where the most tempting activities are all sofa based. I’d eaten a lot of meat and rich food over the weekend, a big plate of roast veggies was just the thing I needed. Having spent the summer months without consuming anything resembling a root vegetable, roasted roots have regained their appeal, so I set about chopping with zeal. Without any accompaniment, this is probably enough for 3 or 4 portions, so providing a few leftovers for the two of us. 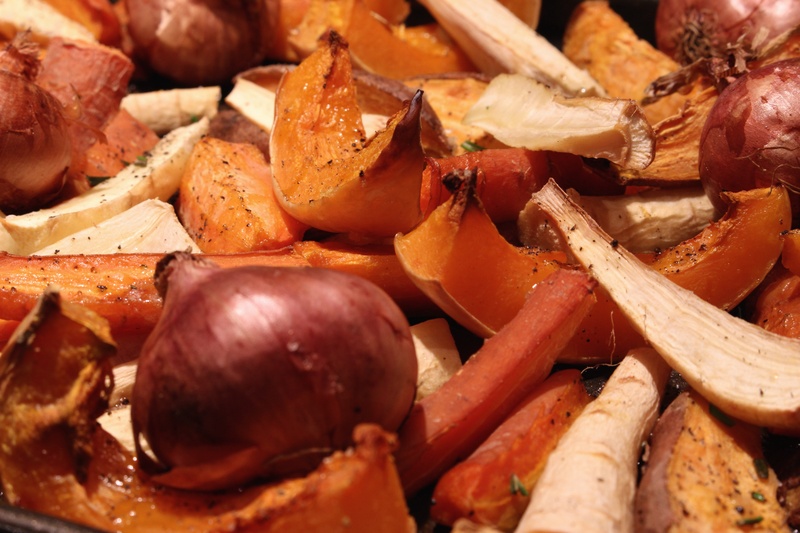 Preheat the oven to 190C and chop 4 mid-sized parsnips, 2 large carrots, 1 medium sweet potato and half a butternut squash into wedges. Spread onto a baking tray, trying to stick to one layer as best as possible. Nestle in some whole, unpeeled shallots, about a dozen or so. Drizzle over olive oil, salt and pepper and roast for around 45 minutes until softened and browning on the edges. The exact time will depend on the size of the pieces. Line a sieve with some muslin or with a couple of layers of a tough, good quality kitchen paper. Add about 150g greek yogurt and leave to drain. This isn’t essential, but I like the slightly thickened result. Meanwhile, on a separate tray, scatter about 50g whole hazelnuts and pop them into the oven for about 5 mins to toast. Leave to cool and then rub off the skins, no need for perfectionism here. Heat a dry frying pan over a medium heat and add 1tbsp cumin seeds, 1tbsp coriander seeds and ½ tbsp fennel seeds. Toast gently, stirring all the time until they become aromatic, being careful not to let them catch. This next bit you could do in a food processor or in a pestle and mortar. Its not exactly hard work using the pestle. 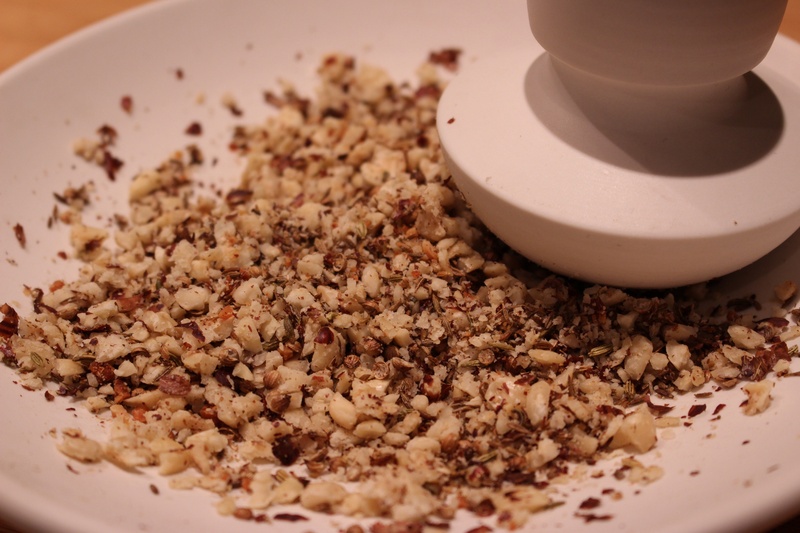 Crush/chop the hazelnuts until fairly finely ground. Then add the toasted spices and give them a bash too, aiming to retain pieces of whole spice rather than grind to a powder. Then add sea salt and pepper to taste and set aside, ready to sprinkle on top of the vegetables when ready. In a small bowl, place a small clove of garlic and bash it a bit to release some of the juice. Discard, so you are just left with a faint garlickiness in the bowl. Add to the bowl 1tbsp tahini and the drained yogurt, a little salt and a little olive oil. The tahini is my way of getting the sesame flavour into the dish, as most dukkah recipes seem to include some sesame seeds, but since I didn’t have any, I did this instead! Once the veg are roasted, sprinkle over the hazelnut mixture to taste and add a good splodge of the yogurt. ← Can it really be autumn?